"“History prefers legends to men. It prefers nobility to brutality, soaring speeches to quiet deeds. History remembers the battle, but forgets the blood. However history remembers me before I was a President, it shall only remember a fraction of the truth...” –Abraham Lincoln. Most of us know of Abraham Lincoln –the 16th president of the United States, writer of the Emancipation Proclamation, preserver of the Union, ender of slavery. But what most of us don’t know is that Mr. President was also fighting another war—one against vampires. Little do any of us realize just how much of a role the undead played in the outcome of the American Civil War. It all started at the tender age of nine when Abe witnessed his mother’s murder at the hands of a vampire. Soon thereafter, revenge became his new mission. With the help of an undead ally, Henry, Honest Abe mounted his own campaign to exterminate the worst of the vampires and free America from their evil clutches. After a very painful attempt to get through the audiobook, I decided to give Abraham Lincoln: Vampire Hunter (the movie) a chance. Have you seen the trailer? Doesn’t it look awesome?! Sadly, we’ve been misled. This movie isn’t awesome. It isn’t even awesomely bad. It’s just plain bad. Initially, I attributed my dislike of the novel to the fact that I’m not one for American or presidential history. I find the subject matter to be quite dull. It’s just not my bag, baby, and that’s okay. I guess I was disappointed because I thought there would be more vampy action in it. So naturally after seeing the trailer, I was led to believe they’d given the movie incarnation the Michael Bay treatment. Oh there was action alright, but not enough of the good kind to save it from being a total disaster. I think the movies failure comes in that it’s just too much, too over the top. Had they attempted to do campy, I could’ve dealt with that, but they didn’t. They took it way too seriously and relied solely on cartoonish CGI effects to achieve the high intensity for which they were aiming. And I know I said I didn’t like the book, but the movie deviated so far away from the original source material that it was barely even recognizable. At least Benjamin Walker nailed it in the looks department though his performance was somewhat wooden and shaky at best. There were, however, a few very cool montage-worthy training scenes which kept me somewhat placated. And I also have to give a big nod to my favourite typecasted bad guy, Dominic Cooper. He’s just the bestest of the bad. All I can really say is this wasn’t the vampire flick I was waiting for, it was more like the one I didn’t need. Awwwww...really? That's a shame. But lol about Dominic Cooper. I had to google him to see who it was, and I do recognize him. He even played naughty Willoughby in the BBC Austen version of Sense and Sensibilty. Yeah, I had a hard time with the audiobook and thought the movie might be the better way to go, but boy was I wrong! Oh, well. It happens from time to time, I guess. I DO love Dominic Cooper though! Strangely, I think I sort of fancy him a bit. Hope you have a Happy New Year, Naida! Grad Student and I just rented this! Lincoln was cute, but that is pretty much where it ends. I was scared, it was violent, and yeah, not good. sigh. 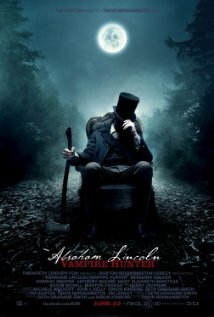 He was and his resemblence to Lincoln (by the end) was pretty astounding, but that's about it. This was one of those rare cases where I really thought the movie would out-do the book, but alas, it did not. I totally agree with your assessment, Lisa. Then again, American Presidential history really isn't my favourite subject which is why I figured the movie might be a better option for me. Unfortunately, it's just a little too unbelievable and overdone. I would definitely recommend skipping it. Boo, hiss! Then again, I skipped the book so the movie wasn't really high on my viewing list! Consider yourself lucky then, Kat! I have been debating for a long time about reading this book and seeing the movie. I do at times find American President history books to be pretty interesting so I may still read the book. On the other hand, I think I will probably pass on the movie. You are not the first person that has said that the movie was far from good. Thanks for the review! If you like the subject matter, then I say definitely go for the book! It's not that the book was bad, it just wasn't right for me. I'm intrigued to hear what you think of it!